Peter Zummo, Paul Zimet, and Tom Nelis in Fusiform Gyrus. Photo by Suzanne Opton. BOTTOM LINE: A thought-provoking blend of music, science, and human nature through a septet of five horns and two men. Have you been to the Evolution Store? You step into a fossilized fever dream: skeletons of lizards and birds, ancient insects preserved in amber, or an imprint in a crevice. It’s a candy store for those of us with an appetite for things that are long dead, but have voices that keep echoing through time. “Organisms at rest with restless eyes,” the play begins, introducing us to its two protagonists: Dr. Fred Decker (Paul Zimet), and Dr. Aiden Grey (Tom Nelis), whose guttural laughter sets the tone somewhere between whimsical and surreal from the get go. Dr. Decker is a taxonomist who appears to have an affinity for the color purple (with his velvet suit and all), but only eats white things. Dr. Aiden, who used to be an entomologist, now devotes himself to Russian literature. 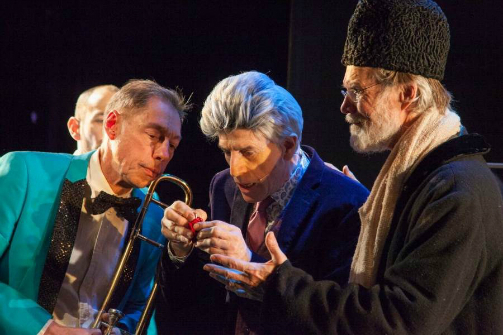 Their eccentricity and rapid fire dialogue, as well as the play's repetitive pattern, recalls a Stoppard play influenced by Sondheim’s use of musical phrases and Dada poetry. Despite the doctoral-level vocabulary and highly intellectual discussions, the plot is relatively simple. The two old friends meet, prompted by birthday packages from their mutual friend Anne Greene (Kim Gambino), whose young daughter Monica (Sumaya Bouhbal) couldn’t believe that she had bones inside her body. Anne had sent an enigmatic video which Decker and Aiden take the rest of the play to decipher. Through misunderstanding and hypotheses, secrets are revealed, their friendship is tested, and truths are found. Completing the septet is the proud troupe of horns: trumpet, alto and bari sax, tuba, and slide trombone. While never fully explained, their presence and resonance is like the physical manifestation of the two doctors’ perhaps overly active minds: neuron firing and synapses clattering. Being both scientists and the witness to history, what they hear and what they know reverberate in those five distinct frequencies. The eye-catching title Fusiform Gyrus refers to a region in the brain that lights up during brain imaging when people describe, and give names to, living things. While an interesting concept, one that perhaps alludes to the use of live music as a storytelling device, it isn’t a clear focal point. Yet in an age where the validity of science is constantly threatened by ignorance in power, Fusiform Gyrus is certainly a breath of fresh, optimistic air. Fusiform Gyrus is by Ellen Maddow. Directed by Ellie Heyman. Set and Video Design by Anna Kiraly. Lighting Design by Mary Ellen Stebbins, Costume Design by Kiki Smith. Production Stage Manager is Kristin Kelly. The cast is Tom Nelis and Paul Zimet. Horn players are Chris DiMeglio, Lathan Hardy, Sam Kulik, Jessica Lurie, and Peter Zummo.